The project that brought real street gangsta rap and hip hop straight from 27 of Los Angeles’ toughest ‘hoods’, Rep Yo Set, is a two-CD compilation produced by noted music executive Charles "Big Chuck" Stanton and entrepreneur Robert W. Lewis III. It features 27 unsigned rappers from the streets of Los Angeles, and will come out Oct. 3 on Lewis'' Reputable Records via Stanton's Drama Family Entertainment, distributed by Redeye, the North Carolina-based independent company that is home to hip hop and rap artists Afroman, Public Enemy, among others. The accompanying DVD, which won Best Documentary at the recent Action on Film Festival in Long Beach last month, will be released through Liaison. The film also received a nomination for Best Director at the festival, which is held in conjunction with the Long Beach International, the longest-running martial arts show and tournament in the U.S. Liaison, an Urban-based lifestyle indie distributor headquartered out of Maryland, has distributed the famed underground classic The Life of Rayful Edmond DVD, releases by Chuck Brown, the Godfather of Go Go, among others. Rep Yo Set was originally slated to come out on Universal Motown through Universal Music Group Distribution, until Stanton and Lewis decided indies would be the best way to go. "This was a completely grassroots project that started on the streets and we felt Redeye and Liaison best understood how to handle Rep Yo Set in keeping with our philosophy," explains L.A. native Lewis. "We wanted to give these artists the opportunity to redirect their energy in a positive manner. These are the same neighborhoods which have produced some of the best and most talented rappers out there." "It just felt like these two companies instinctively got what we were trying to do with Rep Yo Set," added Stanton, who was Vice President and ear to the street at Dr. Dre's production company for eight years, working with such hip hop and rap superstars as Eminem, 50 Cent, Jay-Z and The Game, as well as legends like Michael Jackson, New Edition, Boyz II Men, Luther Vandross and Anita Baker. Big Chuck's 24-year-old nephew prodigy, Ron Feemster, was also involved in the production work. "These kids have lived these stories," adds Lewis. "They know the streets, they know the life, so they have plenty to write about. And these two companies fit perfectly with our approach in building Rep Yo Set from the ground up." 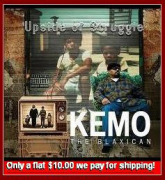 The CD and DVD feature such exciting hip hop rap newcomers as G-Cell (Avalon Gangsta Crips), Tyson (Kelly Park Compton Crips), Squeak RU (Neighborhood Pirus), Redrum (Avenue Pirus) and the Holmes Street Watts, named after their gang. Rep Yo Set could be considered an American Idol for the hood, with future stops planned in N.Y. and a sequel in L.A.
"Guess that makes me Simon Cowell," laughs Big Chuck. "The difference is, I actually know talent and music. I''m looking for artists that can have careers, not just one hot record." Visit www.repyoset.com and get more information and to keep up with this project.